Monday is my personal, all to myself day off. I have the house to just myself and the cats, and I have found that my sanity holds on a lot better since I instituted this policy. Granted, sanity is also maintained to a degree by having my bipolar diagnosis and Seroquel, but the making sure I had a me day every week has definitely been a wonderful boon to my life and times (and that I can actually take it, of course). One thing that I used to do a lot more (when I was staying home more due to non-stop nervous breakdowns) is make a list to try and encourage me to get various things done. Because I’ve been all mixed feeling, I figured that I’d put one to paper to stare back at me. I’m not sure how helpful it’s going to be, ’cause it’s a pretty hefty list by my standards (meaning there is half a dozen things on it). Still, I’ve beaten back perfectionism enough that I know I don’t have to get everything on the list done. I know some things will get done as a matter of course (such as my daily bloggings, which are both on the list and should give me a nice little moment of glee to cross them off). I know that sometimes I will get lucky and find some momentum. 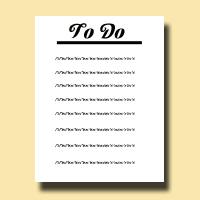 I *know* that I’m lucky that lists don’t freak me out with must do must do as it does some of my friends. It doesn’t make getting chores done any easier in a major depressive episode, but at least it gives me somewhere semi-organized to start. *eyes list and sighs* I should probably try to get moving on it. Or something. What do you guys do to try to motivate yourselves to get things done when the bipolar says that moving is terrible and shouldn’t be done? I’m always curious to hear what other strategies people are able to use to overcome their brain being crap!